I believe calling or purpose is something that is deep within a person’s being. It is an essential part of his/her own existence and identity. It is something we enjoy doing immensely – it may or may not be a part of our chosen work. Sometimes, we are not even aware of what it is exactly or more often we cannot see the patterns among few random things that we really enjoy doing. If I may simplify meaning, I would say meaning is about understanding our connection with others, with this world. In terms of our work, it is understanding connections between our work and how it helps to make difference in this word – it could be superficially as insignificant as working as a cleaner in the hospital or working as barber. It doesn’t always have to be altruistic pursuits or service as such, the crux is understanding how your work is meaningful in the larger scheme of things. I have met few people who knew that their work was meaningful, they were helping some underprivileged kids to get better education. Yet some of them felt unhappy with their work because it was not truly connected to their own purpose or calling. And there are ample examples when people sort of enjoy what they do, but feel their work is meaningless since they cannot see how it helps others or how it makes world a better place. It is immensely satisfying when you know how you are making difference in this world through your own purpose/calling, yet often it is not obvious for many of us. The connection between your own calling/purpose and meaning is worth exploring . There are some interesting stories that I’d like to share. Dr. Abhay Bang is a renowned Indian doctor (physician) & researchers who has completed Masters in Public Health from prestigious Johns Hopkins University. He is a social activist at heart and works in the field of community health in Gadchiroli district of Maharashtra, India along with his equally illustrious wife Dr. Rani Bang. In the early days of his career, he was disturbed by the wages earned by agricultural labour and even fought with the authorities to get better wages for them, but his efforts met with little success. He realized far more effective way to tackle this problem was through his own purpose: through research. His critique of Page Committee recommendations for agricultural labour proved far more effective than his protests and activism. Government increased their wages based on Dr. Bang’s research on calorie requirements for these labour. This reinforced his belief that he should contribute to the meaningful causes in his own way – through his medical knowledge and scientific research. Dr. Abhay & Rani Bang continue to work for tribal health through their organization SEARCH and have done excellent work in reducing infant mortality rate, improving tribal women’s health and so on. Kaushal Inamdar is an Indian singer and music composer. 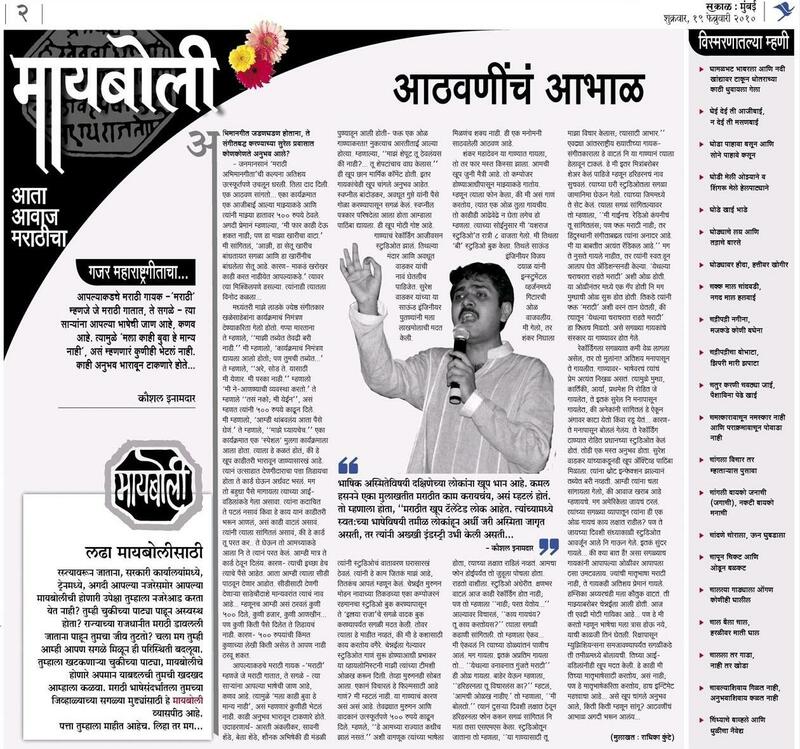 In one of his columns in a local newspaper Sakal, he mentioned how disappointed & angered he felt by the derogatory remarks about his mother-tongue Marathi by senior officer on Radio channel when Kaushal asked his RJ friend why they didn’t play Marathi songs on their radio channel in the capital of Marathi state, Mumbai. That anger and hurt stayed with him for a long time. He felt strongly about his mother-tongue and wanted to do something for it. In his own narration, he realized that he is a singer & musician and he must do something about it through his own purpose – and that’s how legendary Marathi Abhimaangeet was born. It has been sung by 112 established singers and a chorus of 356 upcoming singers. More than 2500 accomplished singers and musicians have directly or indirectly contributed towards it. This huge project was accomplished by collecting small monetary contributions from common people and he did not allow it to become a political agenda. The song won many accolades and there are many interesting stories of its success that you can find in the Wikipedia article about it. My point is his realization – he realized that he can do something meaningful about the cause he feels deeply about through his own purpose, by being who he is – singer and music composer. Mark Bustos is a barber from New York. Every Sunday, his only day off, he walks the streets giving away free haircuts to the poor and homeless. He is making difference in their lives through what he knows best: cutting hair. A filmmaker may make a film about Schizophrenia or Alzheimer if he/she feels strongly feels about it – they won’t necessarily find any cure for these diseases, but they would help greatly in creating awareness through their own way. A poet may write intensely about the oppression if he feels strongly about it – that’s his way of expression. An entrepreneur may create products or services to make this world a better place the way he/she envisages. I believe we can always contribute to meaningful causes through our own purpose, by being who we are. Meaningful cause could be anything that you feel strongly about. Do more of something that makes you really happy, or do something to change the things that really disturb you, or cause pain. And then try to do something about this cause through your own purpose, through your own chosen work. For example, if I feel strongly about work-life balance and endorse saner working hours, how can I do something about it considering my own purpose? I cannot really go and form union to protest against working hours in the organizations – that’s not really me. Though I feel strongly about it, going this way is not being myself. However, I can write about it here on My Zen path, I can discuss it with my clients and try to appeal to their thinking how hectic life could affect them adversely in many ways, I can discuss this with my organizational clients and help them restructure their work culture to make it more flexible and offer better work-life balance. This is how I can do something about it. This can even be taken even further while choosing your work. Find out meaningful cause for which you’d like to dedicate your time and wholehearted efforts, then figure out what you can do by being yourself – through your own purpose. Again, as I have mentioned before, it doesn’t have to be an altruistic pursuit. It could be anything meaningful for you in the larger scheme of things and you contribute with what you love doing most. That’s how you can connect your calling and meaning – and that’s your bliss! Of course, there are monetary consideration as well, but they are way too specific to the individual to discuss here in details. But trust me, you can work out a reasonably happy solution depending upon how you connect the two. Is it okay to have been me? At the end of life, what matters more? How much wealth, fame I have accumulated or how much I have been able to do what I had wanted to do? Without any spiritual connotations, I believe that we are all here with something unique and special in each of us, that’s our purpose/calling – we can enhance it with our learning and experience. Our chosen work, thus, is simply an expression of who we are, or what is unique within us. Is it really worth spending our entire life chasing external rewards and ignoring who we really are? Or would you rather try to figure out your own purpose/calling and see how you could connect it with some meaningful work and create your own unique symphony? You can read Mark Bustos’s story here and here. Tamilnadu state in India now allows workers to form labour unions in IT sector. The featured photo used here Rhinoceros Beetle being helped by a young kid. Next Next post: Why you do what you do?